Certain kinds of writable CD and DVD discs can be erased and written to as many times as you want. 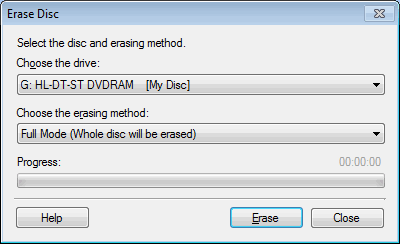 Choose the disc drive from the drop down that you want to erase. There are 2 erasing methods, quick erase and full erase. Quick erase is faster than full erase but does not remove the data physically from the disc. It erases the references to the content and makes the data inaccessible. The data can be restored. Full erase removes the data permanently. This option helps when you want to erase sensitive data so that it cannot be restored. Note: If there are errors when reading a disc, a full erase can sometimes eliminate the problems.